Today’s blog is brought to you by a reader who will remain unidentified because I didn’t get her permission to splay her name across cyberspace, and I’ve learned that I can burn through friends quickly by shining the spotlight on them when they think they’re hidden. My friend might chuckle to know that I’m writing this DESPITE my incredibly Pomeranian morning, during which I had to wrestle my neighbor’s pint-sized ball of teeth into the tub, not once, but twice, because her delicate constitution became, well…matted. Neighbor Pom aside, I do love most dogs. 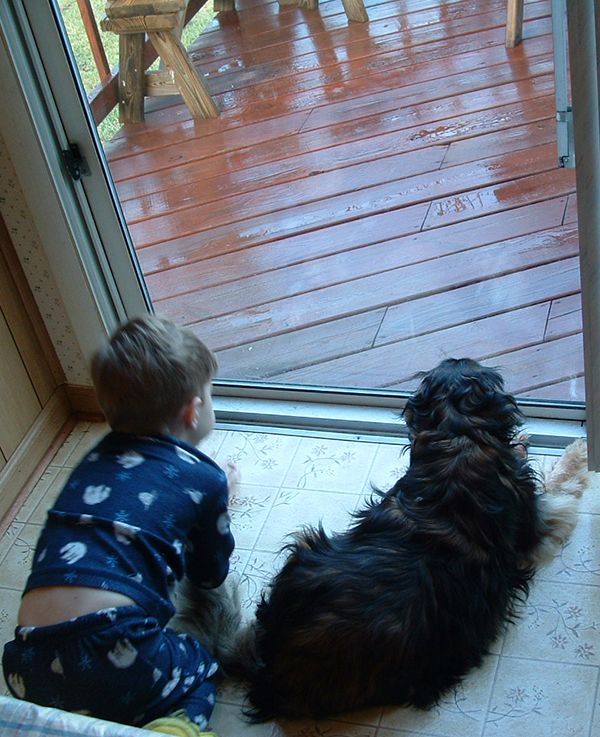 I cannot remember a time growing up when our family did not have at least one, and usually two canines on duty. My favorite pairing was Barnacle the Saint Bernard (so named because he would help us scrape said critters off the boat hull), and Dickens the mutt (so named because she ran like it. She’d race alongside the car on Sunday mornings when we went to church, which was more than a mile away, and be waiting when we arrived. Dad would unload us all and then whistle for her to get in for the ride home). Dickens, who was about the size of a toaster, had the heart of a Viking warrior. Barnacle was as big as a house and had the heart of a koala. He was a clinger—a loveable, drooling, clearly mis-categorized lap dog. We particularly enjoyed watching the show whenever the water dude came to our back door to read the meter. He’d eyeball Barnacle like a prison escapee sneaking past a sleeping guard. Barnacle, always an eager greeter, would bound forward as far as his rope would allow (that thing didn’t hold him back, mind you, it just gave visitors a false sense of safety) and just howl. In Barnacle-ese, he was likely saying (through a spray of slobber), “Oh boy, oh boy! Welcome! Come on over and let’s cuddle!” Then, as the unsuspecting victim edged cautiously toward the meter, Dickens would leap out from seemingly nowhere and nip his ankles. Most of our utility bills were estimates. We even kept a dog when the family moved onto a boat for a while. Brandy, our seafaring Malamute, had to learn how to leap from the ladder to the boat deck, and back to the pier. Occasionally she missed, but she enjoyed any chance to share the joys of life on the water with her humans, and so considered the sporatic sea bath part of the job. Our family pets were usually large dogs. Good dogs. Well, there was one mean-spirited dachshund named Gidget who only lasted two days because she didn’t care for my dad, but she didn’t understand that his was the hand that fed…and she bit it. Repeatedly. Dad loved his dogs. They were all his before any of us could lay claim. Even my sister’s dog, Boots, a golden retriever mix of some sort, took to my Dad like a surrogate. I think it was Boots my parents found in the kitchen (after they’d been away one evening) standing over a pool of blood, grinning as much as a dog can grin. By the looks of the room, significant activity had taken place there, but they’ll never know what happened except that Boots had done his job. Jenny, a loyal dog who would never leave you, even when the rain clouds gathered. We could learn a lot from dogs, particularly with regard to how we treat each other. Dogs are fiercely loyal, quick to forgive, and grateful for our every kindness toward them, and they’re happy to see us come home, whether we’ve been deployed six months in a foreign land or we just stepped out to get the mail. A dog will sit quietly by your side when you’re sad and will dance with you when you’re glad. Dogs will not share your secrets with others or tell you what to do when you tell them your worries. When a dog looks into your eyes, you can see full love and devotion—no deceit, no distraction; you are the center of the universe. Oh, that we would treat each other the way dogs do. I believe that it would make the world a better place…although perhaps a bit more slobbery. Mr. DeRobbio was my English teacher in the 9th, 11th, and 12th grades. He was also my creative writing teacher, and one of the first people in my life to suggest I should consider writing as a vocation. I could never thank him enough for his patience, his encouragement, and the genuine interest he took in my work. Mr. D. was ancient when I attended school in the 70s, so I’m not even sure he’s still with us, but I’ll hunt him down in Heaven, for sure. My two boys are 14 years apart, so I’ve been sending someone to school for 25 years now. That’s a lot of parent-teacher meetings, don’t you know. My oldest, my precious Attention Deficit child, was labeled “unteachable” in his early years. I’m going to tell you a special story about the teacher who saved him. Mrs. Neff taught 3rd grade at a school in Yuma, Arizona, where my oldest had been placed in a “special” classroom for incorrigible students. He hated that class because he loved learning and most of the kids placed there did not. (Sadly, the room earned the nickname “animal house” for the behaviors displayed there). Few people had heard of ADD at that time, and they just thought he was a bad kid. In fact, he was so smart, the teachers just couldn’t keep him busy, and so he self-entertained, often to the point of disruption. Mrs. Neff noticed he had a knack for math and challenged him one day, saying that if he could sit still in her class he could visit her for math class each day. Well, that young man did such a good job that Mrs. Neff opened the door wider, inviting him to visit during reading time as well, and then for science. She also took on the challenge of learning all about ADD, taking night classes and incorporated many of the tips she learned into her teaching, specifically to keep him engaged. By the end of the school year, my son was fully “mainstreamed” and behaving (for the most part) like the rest of the children. My heart nearly broke to think he would have to start over in the 4th grade with someone new. But he didn’t. She moved with him. Just to keep his world consistent. And he thrived. When he neared the end of the 4th grade, we received orders to Virginia and had to leave. 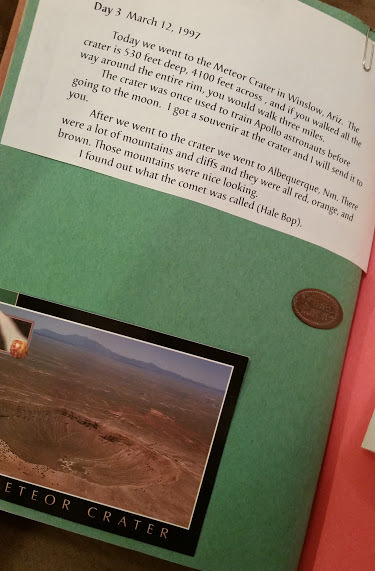 My son made a scrap book of the trip across country that he mailed to his class when he arrived on the east coast. Mrs. Neff shared the book with the class and had them all write notes of encouragement and well wishes on the pages. Then she sent it back to him. What a teacher. I swear to this day that she is the reason he didn’t fall through the cracks. Well…there was also his 6th grade biology teacher who pretended she didn’t know he was listening when she said to us, “Frankly, I don’t think he’s got what it takes to make it in my class,” which sparked an “I’ll show her!” attitude that carried through the year. And Mr. Brown, his high school band teacher, who made band a family, and fostered a strict but caring environment that my son loved. For the privilege of staying in the band, he not only made sure to stay out of trouble in his other classes, but he became an accomplished saxophonist and still plays today. And many others. Today my oldest is a bright, funny, hard-working, compassionate man, and it wasn’t my doing, I assure you. Without just the right people in just the right places, using just the right mix of love and psychology, I honestly don’t know if he would have graduated. So, today I send kudos to all the teachers out there. Know that you are making a difference. And when you get the “unique” students, don’t wonder why they’re in your life. Ask why you’re in theirs. You matter. A lot. NOTE: Thank you to everyone who sent me blog ideas. My list runneth over. I will certainly be drawing from it as the month unfolds. Stay tuned!